Keep your walls and your dart tips looking pristine with the High Density Foam Wall Protector by Trademark Games. This wall protector fits 18-inch dart boards and doesn’t require any fastener to stay in place; simply fit the four foam pieces together around the dart board and the snug fit will keep the wall protector in place. Since the ring is modular, it makes for easy set up and removal for when the dartboard is not in use and makes it easy to travel with for league and club play. The ring adds stability to the dart board to keep it centered and stationary for consistent play. The high-density rubber foam works with soft and steel tip darts. If a dart misses the board, the 1-inch thick foam gently grips the end of the dart to slow momentum and prevent damage to the wall and to keep the dart from falling to the floor or being damaged by cement block walls. The foam ring is reversable, prolonging the life of the wall protector and the handsomeness of your game room, mancave or pub. ADDED STABILITY- Once installed, the ring adds 5 inches of surface area around the dart board. This increases the striking surface and prevents the dart board from shifting to provide hours of consistent and enjoyable play. 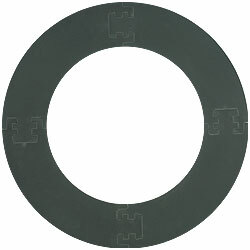 REVERSIBLE-The high-density rubber foam surround is modular, so it is able to be reversed to prolong the life of the wall protector and preserve the handsomeness of your game room, man cave or pub. UNIVERSAL FIT- The wall protector measures 28.25” from outside edge to outside edge and will fit 18-inch boards for a snug seal that keeps the ring in place without the need for fasteners or adhesives. PROTECT YOUR WALLS AND DARTS- The foam is 1-inch thick to slow dart momentum and prevent damage to drywall and sheetrock. It also prevents dart tips from being damaged from striking cement block walls or repeated strikes to plaster or wood. PRODUCT DETAILS- Materials: High Density Rubber Foam. Dimensions: 28.25” L x 28.25” W x 1” Thick.